I went monochromatic on this card – it just seemed appropriate. It reminds me of being in a coffee shop! QKD is blog hoppin’ today, in anticipation of the new releases coming up tonight! 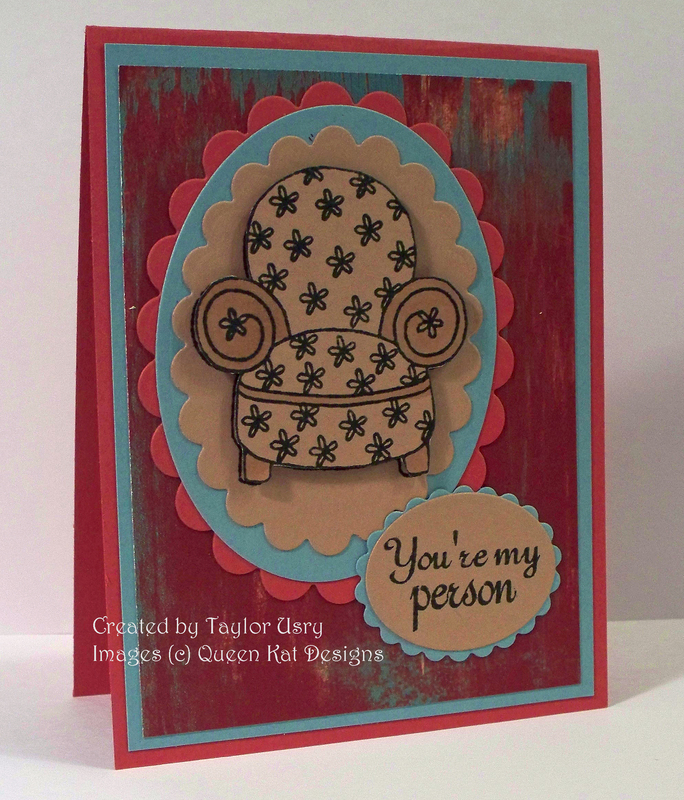 My card uss two of my favorite sets — Get Comfy and You’re My Person. I think that is the sweetest sentiment in the world!!!! I popped the chair up on dimensionals and used a Copic marker to highlight parts of it. Now, I’m sure I’ve done something wrong with this post, like used a set I wasn’t supposed to — but with all I’ve got going on, I’m just thrilled to have made a card, lol! I can’t seem to get good images of the new releases I’ve made – they all come out blurry. So I’ll try again tomorrow when the light is better! Go to the QKD Blog for more deets on the blog hop! Guess what other exciting news I’ve got? I have rejoined Queen Kat’s Royal Court, which makes me an official stamping maid, lol! She has such fun acrylic stamps in her store, and she just released over twenty new ones! You should head over there to check it out. This is a plain and simple card I made using Funky Trees and Greetings #3. It is for a fien who is going through a rough spot, so I left it as plain and simple as I could. Plus, it won’t cost any extra to mail it, so that is good!! I’m really excited to be back working with the talented ladies at QKD – this is going to be so much fun! 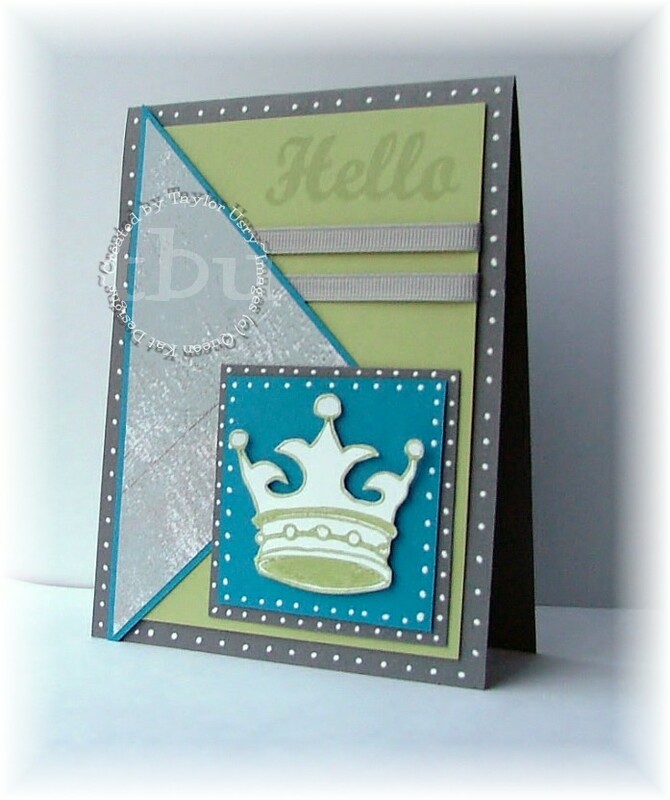 This adorable crown image is a new release over at Queen Kat Designs. It’s called King’s Crown – although I tend to girly it up because that’s what I do! So at my house, the stamp has been renamed Queen’s Crown, lol. I’ve used this layout before – I really love it. All past kits are 20% off — it’s a great chance to pick up some stamps and kits you may have missed! All clearance items are 45% off – whoa!!!! The first Get Inked kit of 2009 is now available for preorder!!! To order it, send an email to info@katstamps.com — and check out the pic of the stamps! How absolutely gorgeous are these? Hot Chocolate and Good Friends! I have two exciting things to show you today! What a way to start the week, right? Since it is the first of the month, the Lizzie Anne Designs newsletter comes out today! Also, fun new projects of the month are uploaded to the site. I adore this little coaster – I made it for my daughter to hang wherever she wanted to — currently it is on the door to her room. 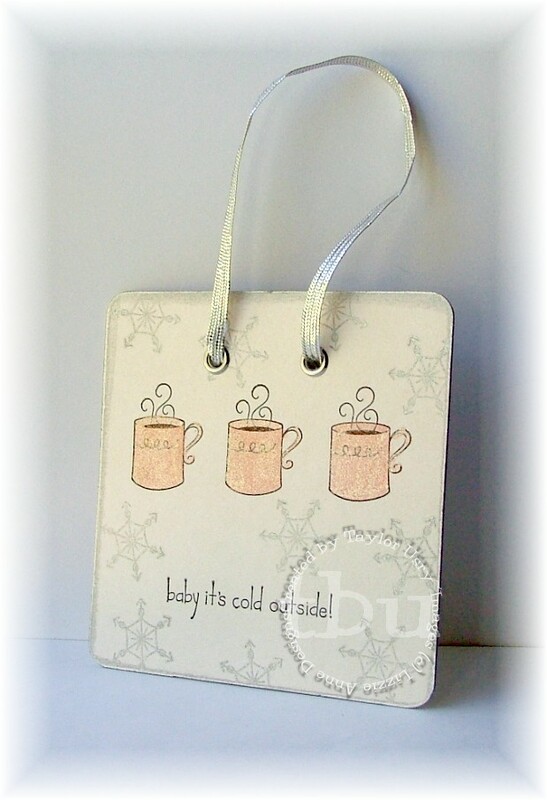 This coaster would make an adorable gift paired with a tin of your favorite hot chocolate! Also, be sure to take advantage of this awesome offer: Free Shipping on orders over $35! Use the coupon code santalovesme in the Lizzie Anne Designs online shopping cart and get free shipping on your order over $35! Free shipping code applies to orders placed in the U.S. and expires on Dec. 24th, 2008. Now, on to fun sample number two! Today is also new release day over at Queen Kat Designs. 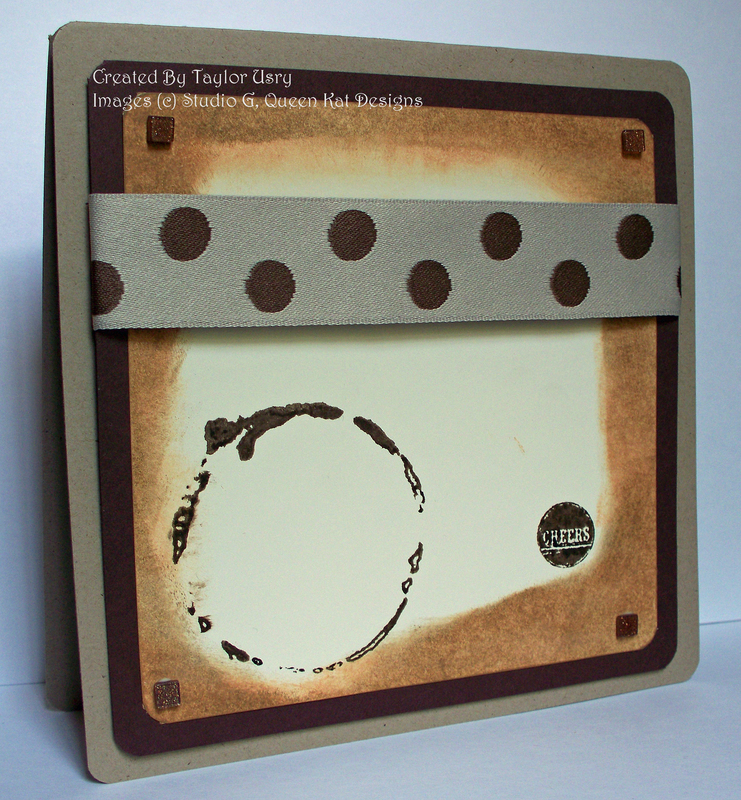 She has so many cute stamps to debut today, so be sure to check the blog so you don’t miss anything! This is the card I’m showing you for the new releases today. 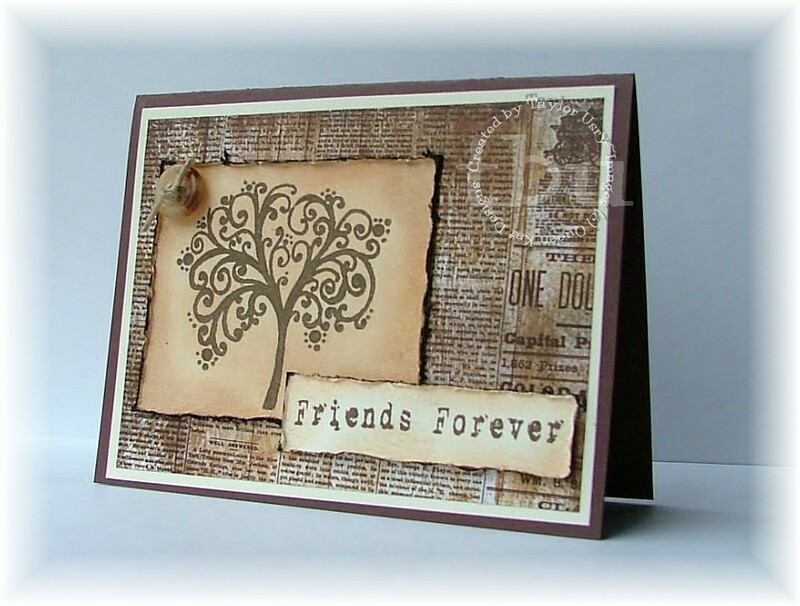 It uses a sentiment from the new set called Friends Forever – how fab is the font?? 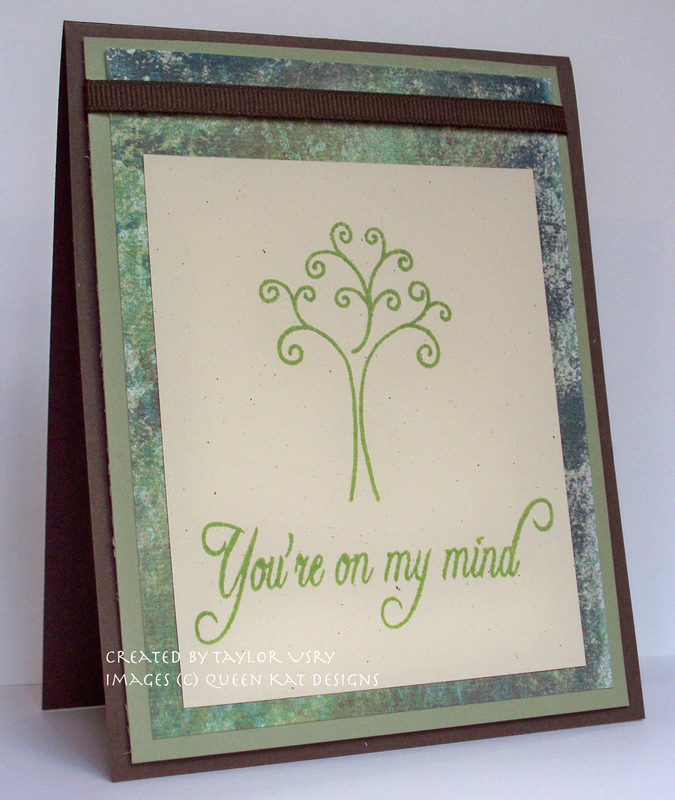 I paired it with the tree from the November Take 3 stamp kit. If you don’t know about that monthly club, check it out here. Awesome stamps, I’m telling you! I love this layout. It started out as something completely different, and totally went it’s own way until it ended up like this. That happens to me quite often – but it is really fantastic when I *love* how it turns out! The color scheme for this card came from a color combo challenge on Splitcoast. 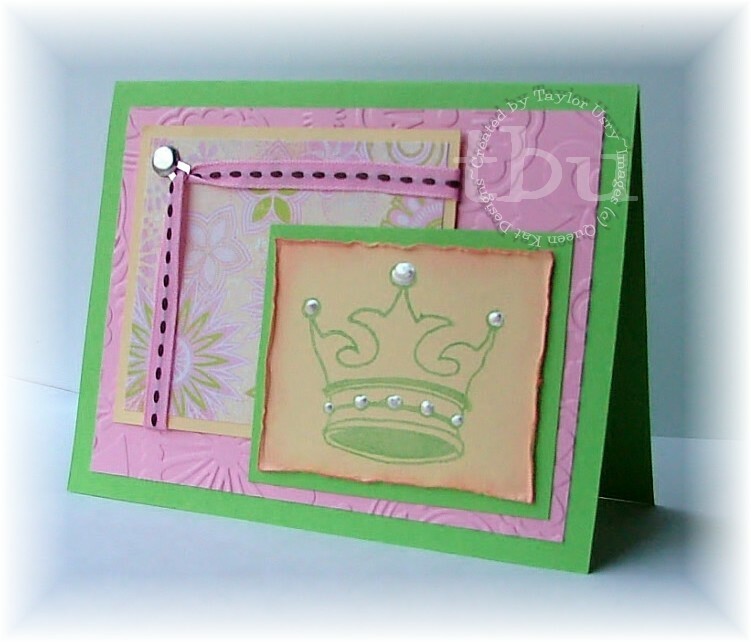 I used stamps from Queen Kat Designs – the crown is a single called King’s Crown (and I believe it is available as of Dec. 1st) and the sentiment is from a set called Crowning Moments. It is retired, and not available any more – bummer, I know. I love the size of the sentiment! I went a little nuts with the white gel pen, but I love the end result! I started out just putting them on the small blue panel, and I just kind of didn’t stop! I admit it – I am head over heels in love with this snowman! He just looks so sweet, and inviting, and I totally want to hug him, lol. I’m actually in love with the whole darn set, to tell you the truth. It is SO cute. It’s called Build a Snowman, and it’s available through Queen Kat Designs. I made this card for the Color Combo challenge on Splitcoast last week. And let me just say, I love this color combo! I paired it with some DCWV Once Upon a Time cardstock, from the mat pack I got at AC Moore. I love the hint of shimmery green it has!